I just wanted to share a bit of fun from my daily research work. I monitor a lot of honeypot data on a global scale, most of which is generated from HoneyPoint, of course. The HITME produces large amounts of data every hour, and it is a ton of fun to play with. But, I also monitor several Twitter feeds of honeypot data, and I wanted to share a few quick things with you from there. Do you generate data like this? If so, how do you play with it? Hit me up on Twitter (@lbhuston) and share your process. Prior to joining MicroSolved as an Intelligence Engineer, I was the Information Security Officer and Infrastructure Manager for a medical management company. My company provided medical care and disease management services to over 2 million individuals. Throughout my tenure at the medical management organization, I kept a piece of paper on my bulletin board that said “$100,000,000”. Why “$100,000,000”? At the time, several studies demonstrated that the average “street value” of a stolen medical identity was $50. If each record was worth $50, that meant I was responsible for protecting $100,000,000 worth of information from attackers. Clearly, this wasn’t a task I could accomplish alone. Through my membership with the Central Ohio Information Systems Security Association, I met several members of the MicroSolved team. I engaged them to see if they could help me protect my organization from the aforementioned attackers. They guided me through HIPPA/HITECH laws and helped me gain a further understanding of how I could protect our customers. We worked together to come up with innovative solutions that helped my team mitigate a lot of the risks associated with handling/processing 2 million health care records. A core part of our solution was to leverage the use of HoneyPoint Security Server. By using HoneyPoint, I was able to quickly gain visibility into areas of our network that I was often logically and physically separated from. I couldn’t possibly defend our company against every 0-day attack. However, with HoneyPoint, I knew I could quickly identify any attackers that had penetrated our network. Working for a SMB, I wore many hats. This meant that I didn’t have time to manage another appliance that required signature updates. I quickly found out that HoneyPoint didn’t require much upkeep at all. A majority of my administrative tasks surrounding HoneyPoint were completed when I deployed agents throughout our LAN segments that mimicked existing applications and services. I quickly gained the real-time threat analysis that I was looking for. If you need any assistance securing your environment or if you have any questions about HoneyPoint Security Server, feel free to contact us by sending an email to: info@microsolved.com. This post contributed by Adam Luck. This post builds on the What is HPSS? Series. Previous posts are here and here. HoneyPoint Agent is the original detection capability of the HoneyPoint Security Server suite. Basically, it allows a system to offer up a variety of “fake services” to the network for the purpose of detection. These services can either be simple port listeners or can be complex, deeper emulations of protocols like SMTP, HTTP, Telnet, FTP, etc. These ports have no real users and no legitimate traffic flows to them. This means that anytime these ports are tampered with, the interactions are “suspicious at best and malicious at worst”. Because the Agent is designed to be extremely light weight in terms of computing power needed, the Agents can be sprinkled throughout the network environment easily. Many organizations simply add Agent into default server and workstation builds, turning most of the systems in their network into sensors for detection. Other organizations deploy Agent more sporadically, either using virtual or physical appliances dedicated to HoneyPoint hosting. These organizations often assign multiple physical or virtual interfaces to the devices, allowing them to have a presence on many network segments at the same time. Still other users leverage an approach called “scattersensing” by deploying HoneyPoint on systems that they move periodically around their environment. This makes for a less dependable detection mechanism, but gives them the capability to get more vision into “hotspots” where targeting is expected or where malware is more likely to pop-up. The most successful HoneyPoint Agent deployments use a combination of these tactics, along with including strategies like DNS redirection of known command and control sites and other more active forms of getting bad traffic into the HoneyPoint systems. HoneyPoint Agent has proven to be very useful in identifying scanning and malware outbreaks. Customers with supposedly secure networks have found malware that had been missed for years by their traditional internal security tools. These were detected when the ongoing slow and low scanning triggered HoneyPoint deployments, particularly for SQL, Terminal Server and other commonly targeted ports. HoneyPoint Agent can be configured through the command line or via a GUI application, making it easy to manage and deploy. Once installed, it is a “deploy and forget” style tool which doesn’t require ongoing tuning or signature updates. Generally speaking, customers deploy Agent and it runs for years without feeding and care. 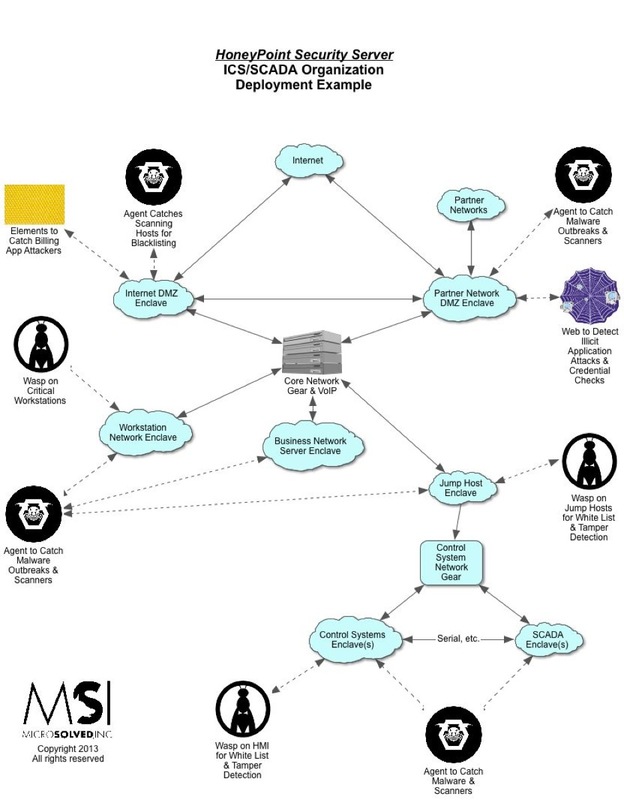 HoneyPoint Agent also features MSI’s patented “defensive fuzzing” capabilities (previously known as HornetPoint mode), which can create self-defending services that attempt to take down attacker tools during their probing to interfere with propagation. Still other users automate defense with Agent using it as a means for black holing hosts that probe their environment. In these optional, more active roles, Agent can help organizations strengthen their posture with a “one strike and you’re out” kind of approach. 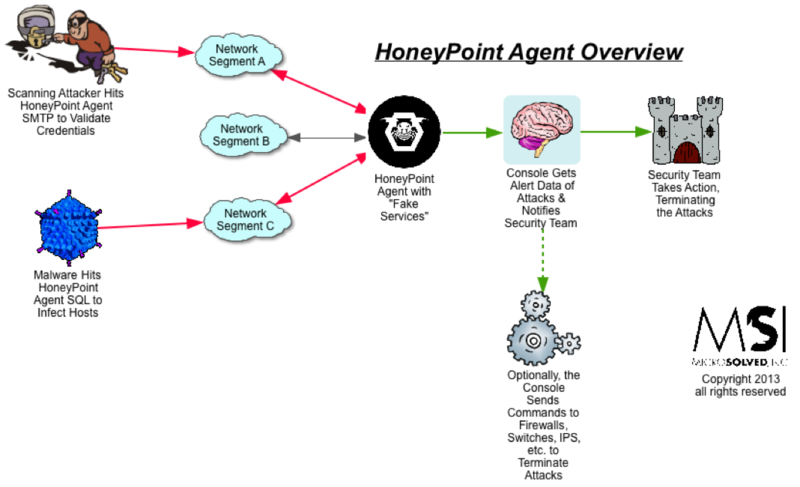 HoneyPoint Agent runs in Linux, Windows and OS X. It communicates securely with the HoneyPoint Console. It also features user configurable services, a known scanning host ignore list (for ongoing vulnerability assessment clients) and a wide variety of common service emulation templates (available through support). To learn more about HoneyPoint Security Server or to get a demo, please contact us. We would be happy to walk you through the product and discuss how it might fit into your environment. There is even a free for personal use “Community Edition” available to get you started or to let you experience the power, ease and flexibility of the platform yourself. Just give us a call to learn more about HoneyPoint Security Server and HoneyPoint Agent. You’ll be glad you did! This article builds on the What is HPSS? Series. The original overview article is here. 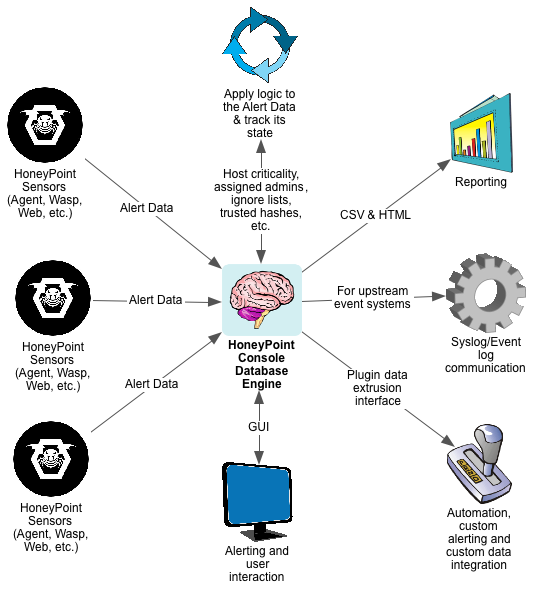 The HoneyPoint Security Server Console is the “brain” of the HoneyPoint product platform. It is the central component responsible for getting alert data from the sensors, tracking and maintaining the alert data, presenting it to the user and safely passing the essential alert data on to the automated plugins or other systems in the security event chain. The Console is a GUI application that includes a built-in database engine for tracking Alert Data state and to empower reporting and analysis over time. Alert Data from the sensors are sent to the Console over TCP and the data is encrypted. The Console application runs on Windows, Linux and OS X. Once the Console receives Alert Data from the sensors, it parses it to validate that the data is good and checks to see what actions it should take based on the alerting configuration, assigned admins list, ignored hosts lists, and other trust rules in place. It then presents the alert data to the appropriate mechanisms, alerting users, passing the desired elements of the alert data to syslog/event log on the Console system for upstream processing by SEIMs or other event tools. The Console also passes certain event data as determined by the configuration into the “plugins mechanism”. The plugins then execute the desired operations on the data, easily allowing the security team to further extend reporting to custom event handlers or perform automated responses. This flexible solution empowers the security team to integrate HoneyPoint Security Server fully into whatever technology platform/response process they desire or have in place. Reporting from the Console is very simple. The included reporting engine can create a wide variety of canned reports in either CSV or HTML format, ensuing that the data in the HoneyPoint system is easy to use. Additionally, other reporting tools like Crystal Reports or the like, or even languages like PERL, Python or Ruby, can easily attach to the Console database to create whatever types of custom reports you desire. All in all, HoneyPoint Security Server was designed to make it easy to use and yet flexible enough for the most demanding and mature infosec teams. The console interface is friendly, functional and easily understandable. Most teams require less than a 30 minute walk through before they are off and running with the basic detection power HoneyPoint provides. When they get comfortable with the system, they quickly master the plugins meta-language and are soon automating large groups of detection and response tasks. 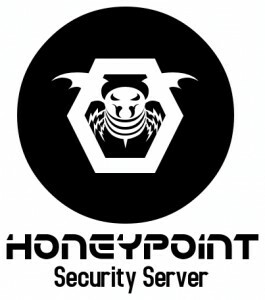 To learn more about HoneyPoint Security Server or to get a demo, please contact us. We would be happy to walk you through the product and discuss how it might fit into your environment. There is even a free for personal use “Community Edition” available to get you started or to let you experience the power, ease and flexibility of the platform yourself. Just give us a call to learn more about HoneyPoint Security Server Console. You’ll be glad you did! A honeypot is a trap set to detect or deflect attempts at unauthorized use of information systems. Generally it consists of a computer, data or a network site that appears to be part of a network but which is actually isolated and protected, and which seems to contain information that would be of value to attackers. It is important to note that honeypots are not a solution in themselves. They are a tool. How much they can help you depends upon what you are trying to achieve. There are two different types of honeypots: production and research. 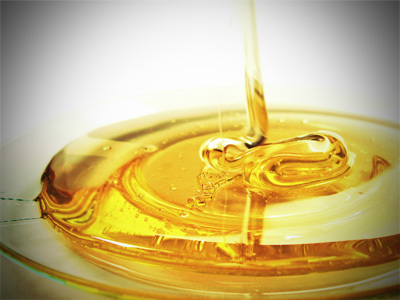 Production honeypots are typically used by companies and corporations. They’re easy to use and capture only limited information. Research honeypots are more complex. They capture extensive information, and used primarily by research, military, or government organizations. The purpose of a production honeypot is to mitigate risk to an organization. It’s part of the larger security strategy to detect threats. The purpose of a research honeypot is to collect data on the blackhat community. They are used to gather the general threats against an organization, enabling the organization to strategize their response and protect their data. The value of honeypots lies in their simplicity. It’s technology that is intended to be compromised. There is little or no production traffic going to or from the device. This means that any time a connection is sent to the honeypot, it is most likely to be a probe, scan, or even attack. Any time a connection is initiated from the honeypot, this most likely means the honeypot was compromised. As we say about our HoneyPoint Security Server, any traffic going to or from the honeypot is, by definition, suspicious at best, malicious at worst. Now, this is not always the case. Mistakes do happen, such as an incorrect DNS entry or someone from accounting inputting the wrong IP address. But in general, most honeypot traffic represents unauthorized activity. What are the advantages to using honeypots? Honeypots collect very little data. What they do collect is normally of high value. This eliminates the noise, making it much easier to collect and archive data. One of the greatest problems in security is sifting through gigabytes of useless data to find something meaningful. Honeypots can give users the exact information they need in a quick and easy to understand format. Many security tools can drown in bandwidth usage or activity. NIDs (Network Intrusion Detection devices) may not be able to handle network activity, and important data can fall through the cracks. Centralized log servers may not be able to collect all the system logs, potentially dropping logs. The beauty of honeypots is that they only capture that which comes to them. Many of our clients swear by our HoneyPoint family of products to help save resources. With its advantages, it’s easy to see why! Leveraging the power of honeypots is an excellent way to safeguard your data. If you’re looking for a security tool that goes beyond NIDS, you’re in luck. MicroSolved’s HoneyPoint Security Server has revolutionized the ease and power of what honeypots can do and be. With the emergence of HoneyPoint Wasp, you can also apply the HoneyPoint magic to your Windows desktops. HoneyPoint Wasp monitors your desktops for any new applications it has not seen before (Anomaly Detection). Should Wasp detect new code, the end-user will never see a pop-up alert. Instead, you will be notified and able to quickly take action. Should the notification go without follow-up action, HoneyPoint Wasp assumes the allowed application, and no future notification will be sent to the console (Self-Tuning White Listing). As you’ll see in a moment, the HoneyPoint Security Server is much more than a mere intrusion detection system.. It’s an underlying framework of rock-solid code that’s been built to achieve three important goals: identify real threats, isolate and tamper with the attacker’s results, and “smart” detection processes that allow you to target attacker availability.